Fidia Co. will feature a K199 high-speed 6 axis milling center with rotary table, C-40 vision numerical controls with integrated ViMill system and a variety of large milling heads at the 2016 IMTS Show in Booth No. S8880 in the South Hall of McCormick Place in Chicago, September 12-17, 2016. 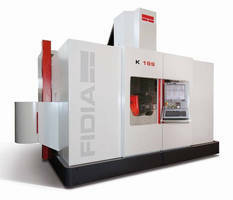 The K199 is Fidia’s most compact K series machine and represents the ideal solution for all small and medium size molds and prototype manufacturers. The machine design features a cast iron bed and worktable for high loading capacity, a rotary table for 6-axis capability, continuous, powerful, compact bi-rotary milling head, and a standard C-20 numerical control. The Fidia C-40 vision numerical control is believed to be the most powerful numerical control on the market for advanced CNC high-speed milling and multi-axis applications. The control is equipped with a Quad core processor, state-of-the-art graphic processor and a 64 bit Windows® 7 operating system which allows for precise execution and virtual machining of the tool path using the Fidia ViMill system. The C-40 control demonstrated at IMTS will also be equipped with a V5 software package for axes control that significantly improves the performance of high-speed milling machines. Fidia will also be displaying their larger 5 axes positional and fork-type milling heads from their complete milling head line. These M5 5 axes bi-rotary heads are for medium size and large milling machines that perform the complete machining cycle, from roughing to finishing, where higher torque and power are required. Fidia S.p.A. was founded in 1974 in Turin, Italy. Fidia designs and builds numerical controls and high-speed milling machine systems for the production of complex-shaped parts for the automotive, aerospace and energy markets. Fidia is among the world leaders in the field of numerical controls and one of the few that can provide their own on-board electronics, controls and process software for their range of milling machines. The Fidia Group employs proximately 341 people and has three industrial sites in Italy, one joint venture in China and subsidiary operations in Germany, Spain, Russia, Brazil, France, India, China and the United States. Fidia S.p.A. is listed on the Milan stock exchange. Allan G. Hall, Hall Industrial Publicity, Inc.